The CHEOPS satellite during preparations for ElectroMagnetic Compatibility (EMC) testing in the Maxwell test facility at ESA's technical centre in the Netherlands. 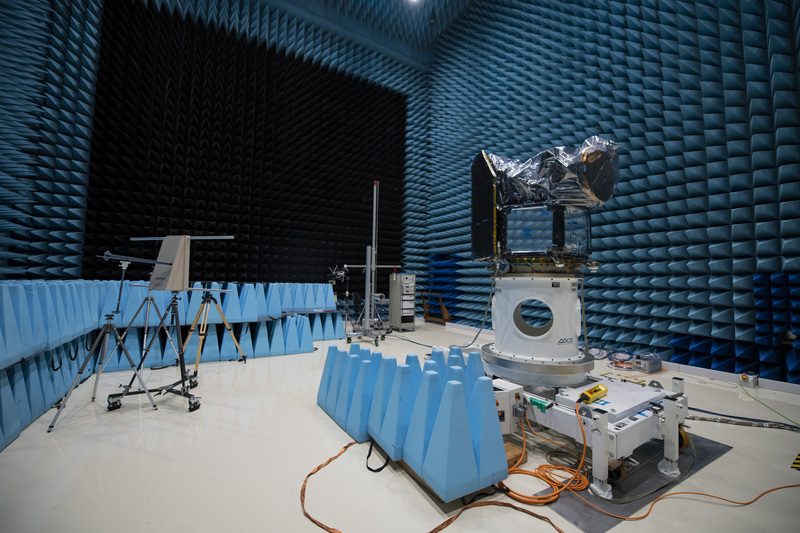 The science instrument of the CHEOPS satellite is protected by a plastic dust cover, whereas the exposed side panels of the spacecraft platform reflect the blue foam pyramids lining the walls of the Maxwell EMC facility. The resistive, carbon-loaded foam pyramids are shaped to cause multiple reflections that attenuate incident radio-frequency waves. Beneath the foam pyramids, the walls of the chamber are lined with steel panels that form a so-called 'Faraday cage' to keep test signals in and parasitic radiation out. Different types of test antenna, each covering different frequency ranges, can be seen on tripods to the left.